One of the longest running Sonoma Valley bands is about to release a new CD, but odds are you've never heard of them. Astral Kitchen, who has been gigging and recording since 1991, are putting the finishing touches on their latest venture, tentatively called "Elements." The band has quite a story, starting with the name. 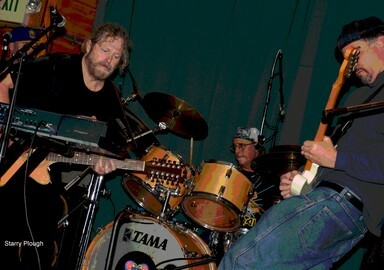 After jamming together all through high school, Chris Blackard, Mark Yeske and Norbert Mazari found themselves with a large - well - huge barn at the top of Trinity Road with an immense door that opened out to the stars that used to give them inspiration as they wrote songs, gazing out at the "Astral Kitchen." The self-titled first release did well, with its hard rock feel and a bit of progressive vibe, and landed the band regular gigs at the clubs inside Travis Air Force Base. In 1994, some of the band members headed to Colorado, but that didn't stop Blackard, who essentially set up a Colorado and California version of the band. Soon after, one of the founding members, Mark Yeske, was to pass away from diabetes, but the band pressed on in his memory. CDBaby Internet music site. The release also brought them a West Coast tour with 135 dates. In 2006, "Diabolic Design" was released, to critical acclaim, but not as successful in the distribution channels, as unlike in 2003, there were now thousands of bands on CDBaby and other online music distribution sites, and the market was saturated. "I really thought that album was some of our best work, and was a little disappointed it wasn't more popular," said Blackard. The years that followed brought record company hassles and a feeling that a new direction was needed, so now without a record deal or a band, Blackard and Mazari found themselves writing material for the next album in 2009, with a little different groove, stepping away from the traditional hard rock vibe they were known for. The new release has 12-string guitar tracks, flutes, mandolin and a variety of other instruments. Blackard describes the sound as "... kind of a Dave Matthews meets Yes meets Jeff Beck groove." The recording did not come without its own wages though, with founding member Mazeri passing away this last April during the recording process, coincidentally also from diabetes. 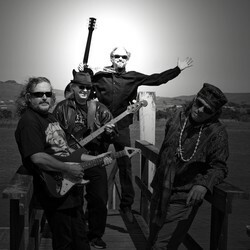 Blackard has assembled a fine group of seasoned musicians to back him on the upcoming 2011 tour, planned for this summer, including an appearance at the July 5 Sonoma farmers market. "We would love to play Sonoma more often, but it just seems that we haven't really had the chance or the time wasn't right or something," Blackard lamented. We got to check out a preview track called from the new disc called "Star" and it is a bit tamer and has the groove Blackard describes about the new sound. We're really looking forward to checking out the entire new CD. If you want to know more about the band, the tour and when you can get the latest release, hit the band website at www.astralkitchen.com and sign up for their mailing list, and if you do, you will receive a free song from the new album. The release of ASTRAL KITCHEN's new CD Diabolic Design is banging hard on the door that separates world fact, and political fiction. Sonoma, CA (Billboard Publicity Wire) November 15, 2006 -- ASTRAL KITCHEN has released their new CD Diabolic Design, now available at Amazon.com, CD Baby, astralkitchen.com, and many popular digital download sites. Great writing, and the mix of Classic, and contemporary Rock, is what makes this band palatable to fans of all ages. It has been a long time in Rock and Roll history that a power Rock Drummer has fronted a rising Rock band. Remember Bands like Rare Earth, Genesis, The Eagles, they all had great singing drummers, but in modern Rock history, no one has attempted such a feat. Chris Blackard has been at the helm of the Rock Band ASTRAL KITCHEN, pounding out the rhythms, and providing a powerful Rock vocal presence since its origin in 1990. ASTRAL KITCHEN's "overnight success has taken sixteen years to accomplish, and the music has held a place of its own, though diversity, and perseverance." "Great writing, and the mix of Classic, and contemporary Rock, is what makes this band palatable to fans of all ages." The power and energy of live performances, propel this band into fury of synergy that demands the attention of audiences. With the 2006 release of Diabolic Design, the band proves again that they are a force to be reckoned with. The CD, a powerful collection of ASTRAL KITCHEN's many musical influences, can be described as both eclectic, and Rocking. The listener transcends many distinct levels of rock music, never able to predict where the ride will take them next. Love that high-hat intro. This song fakes you into a mid-80s pop lull and comes screaming out at you with postured lyrics and tight arrangement. The singer really gets into it after the first verse, that's where I got the hook. Especially the strage melody on the second half "mood is faster". The lyrics are so perfect with that semi-dissonant guitar backing, a real tired evil feel. It's a real original arrangement, a song you can't listen to once. That drum line around 2:00 is so sweet, the drums really do feel like an instrument in this song. But that solo is what kills me, frankly. With the ride bell going, that moves me. Extra Credit: Male Vocals, Guitars, Drums, Melody, Mood. I AM IN LOVE WITH THIS SONG!!!! It is amazing! Can you PLEASE tell me where I can hear more of your music and found our more about you? AMAZING JOB! GOOD LUCK! Extra Credit: Male Vocals, Guitars, Drums, Bass, Keyboards, Programming, Production, Lyrics, Melody, Beat, Mood, Originality, Most Rocking Track. Really like this - the intro has a fantastic out-there tempo feel and the band and drummer bring it together really powerfully. Excellent job - full marks for doing a real 70's style classic rock tune properly - sounds liek the sort of thing we do! Extra Credit: Male Vocals, Guitars, Drums. Good intro building to the guitar riff when the song takes off and doesn't seem to let off from there. The chorus is catchy and the vocals are strong and the works very well. The bass is excellently mixed. Performance is excellent. Lots of nice lead work in the bridge powerred by thumping drums. Arrangement is good as it's original not lending itself to and previous music cliches. The production is very good with every element of the song transparent and rockin. Extra Credit: Male Vocals, Guitars, Bass, Production. wicked guitar line starts this monster!! heavy and real! reminds me of acid rock in the 70's.. especially alice cooper but totally new and different.. this is a killer tune that people dont get to here much anymore.. awesome changes throughout the tune! not a tough song to play but sounds like a blast! i can see people diggin on this song! cool solo and bass line!! Extra Credit: Originality, Most Rocking Track. This is a nice driving rock and roll band. Very early beatlesque. The harmonies especially. The vocals are a little remeniscent of They might be Giants. Catchy and you can tell you guys get Rock and roll! They know how to write a hook, And the Rythym section is excellent. John, Paul, George, and Ringo would be proud your Rockin a** tunes!!!! I totally enjoyed the show. I see a future for this hard working band! Norbert Mazari, Chris Blackard, and Mark Yeske formed the ASTRAL KITCHEN in 1990. They started as a power trio, with straight-ahead rock and roll rhythms, and clever heady lyrics. When recording the first CD, ASTRAL KITCHEN (AK Records) simply wanted to get their music out so they could play. Everyone sang on that CD, in fact Mark's quirky voice, and Chris's classic sounding vocals is what made that album interesting To this day, ASTRAL KITCHEN is still selling thousands of downloads of the first CD. This was truly the beginning of a classic band. In 2003, with the release of Dirty Things, the band took on a savvy sound that explored some of the pop culture sounds of the day. Drawing from influences like Pink Floyd, Bowie, Beck, and other "retro" sounding bands, ASTRAL KITCHEN proved again, that they were ahead of the curve. The Dirty Things project was intended to recruit new and fresh blood to the music. The CD was recorded with just Mazari, and Blackard doing all the parts. Soon a live band was assembled with crack musicians that really brought the music to life. The Dirty things tour ended in September of 2005 after 135 road shows on the West Coast. 2006 brought the release of Diabolic Design. (AK records) with critical acclaim from both Rolling Stone, and Billboard online. Built on Raw fire power, and big production, ASTRAL KITCHEN continued to tour on Diabolic Design for three years. 206 shows later, in September of 2009 AK set out for the recording studio to create yet another chapter in the ASTRAL KITCHEN saga. "Elements" with the single "STAR" has been receiving great reviews, and Radio airplay. 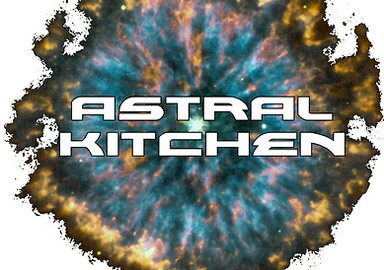 The ASTRAL KITCHEN is an original band. We have a large catalog of original tunes that can be heard on our Four releases. We also have a large selection of tribute cover material. This makes it easy for us to fit in most venues that support the “Rock” genre. But if the show calls for tribute covers, we got it covered! Will I follow you once more? in our Diabolic design...OH NO! I mean can you feel me? what’s that going on?…Oh mama! ‘Cause it’s getting really hot out here! She hears it saying-… She hears.. In a Astral Kitchen- The universe is opening- opening for you…and you…..and you…. Unfaithful- lies- and memories - just won’t fade.